This article is about the railway station. For the town, see Perinad. For the city, see Kollam. Perinad railway station (Code:PRND) is an 'NSG 6 category' railway station, situated near the city of Kollam in Kollam district of Kerala. Perinad Railway Station is falls under the Thiruvananthapuram railway division of the Southern Railway Zone, Indian Railways. 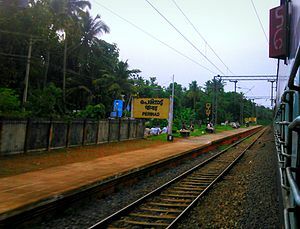 Perinad railway station is situated between Munrothuruthu and Kollam Junction railway station. The nearest important major rail head is Kollam Junction railway station. Perinad is well connected with various cities in India like Kollam, Trivandrum, Kochi, Thrissur, Kottayam through Indian Railways. It is one of the closest railway stations to Kollam Technopark and Institute of Fashion Technologies, Kerala(IFT-K). Passenger trains having halt at Perinad railway station. Wikimedia Commons has media related to Perinad railway station.